"I see the destructive side of humankind, the blind spider; she fiddles in the poisonous gloominess, dreaming dreams full of mushroom clouds. All is explained by death, she whispers." In 2002 the chemist Paul Crutzen suggested that the effects of human population and culture on the environments of earth are so pronounced, that they will leave a permanent geological marker in the stratigraphic record of the planet. Most geological epochs were defined in historic times by observed geological changes in lithology, petrology and especially paleontological content -the extinction and replacement of species in the fossil record. Fig.1. The "Appearance of Man", by L. FIGUIER 1872. Humans artefacts where recorded in the stratigraphic column since our first ancestors developed lithic industry, but only in the Holocene human activity and influence on environment is observable in the deposited sediments. 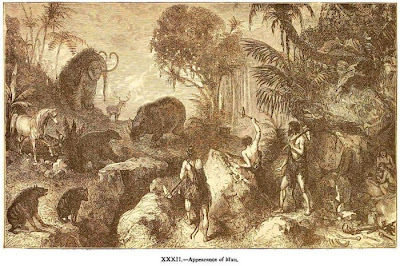 The use of fire to clear land and hunt animals maybe has forced the extinction of the Pleistocene Megafauna. With the development of agriculture and pasture the pollen spectrum of plants recorded in bog sediments shifts significantly, tree species diminish, grass and cultivated plants increase. With the first civilisations, geochemical changes as results of environmental pollution by mining and handling of metals are observed in lake sediments and in the ice records of Greenland. The impacts of humans increase during the second half of the Holocene as a result of increasing population and development of large civilisations, with many humans working together to realize projects that single individuals couldn't possible achieve by itself. In the last 200 years humankind has surpassed all efforts of previous generations. Humans use the majority of natural resources, like soil and water. Water is stored of redirected, and soil and sediments are cultivated, excavated, transported and deposited, influencing sedimentation patterns and causing a lithological change in the geological record. The burning of fossil fuels has altered the chemistry of the atmosphere, that on its own will influence temperature and precipitation, again influencing erosion (for example improved chemical weathering) and deposition. The arguments were considered by some geologists and a term coined for a possible new geological period - the Anthropocene, used informally in literature to refer to the actual period since the Industrial Revolution, when our technology enabled us to previous unthinkable efforts to shape earth and nature. The mentioned Pleistocene extinction proceeds with increasing speed on land and in the seas, active hunt, destruction of habitats, relocation of animals and plant species, spread of pathogens, climate change have all catastrophic effects of the native fauna and flora. The results are permanent in the fossil record, extinct species are no longer available to evolve, and future evolution will take place on surviving (and frequently anthropogenic relocated) stocks. Is the modern loss of species already comparable to the geological past? 99% of all species ever lived on this planet in the last three and a half billion years went extinct - extinction is the rule, not the exception, however the constant rate of extinction and speciation was interrupted by phases of increased velocity in the loss of species. In all cases the exact mechanism is still poorly understand, possible factors contributing to the disappearance of species are geological catastrophes like volcanism, impacts or climate change, but also biological factors like competition, diseases or depletion of resources. Mass extinctions are characterized by the increase in both extinction rate (loss of species per time) and extinction magnitude (amount of lost species) compared to the normal geological background. It is notable that during mass extinction all kind of organisms group, if worldwide distributed or local, if generalists or specialized, if numerous or rare, if large or small can be affected. In the record of earth five large, natural occurring mass extinctions (the big five), characterized by the loss of at least three-quarters of species in a geologically short interval (typically less than 2 million years), are recognized: near the end of the Ordovician, Devonian, Permian, Triassic and of the Cretaceous Periods. To compare these past mass extinctions to the assumed modern one is complicated by the incomplete record of both fossil as living species. Fossilization is a rare event, many organisms without hard parts like bones or shells are presumably lost forever and many fossils maybe still slumber undetected in remote parts of the globe. If a species is described based on the recovered remains this concept of species can be in conflict with the modern definition of species, many species described on fragments were subsequently discovered to belong to a single species. Also our knowledge of the modern biodiversity is far to be complete, especially small critters, like bugs or other invertebrates, are much underrepresented when compared to mammals or other vertebrates in the studied and described species. In addition from most of the described species the conservation status is unknown. Considering these problems, a published study by BARNOSKY et al. 2011 tried to compare the mass extinctions with the actual loss of species. Today from 48.000 species in the Red List compiled by the International Union for Conservation of Nature (IUCN) 3.325 are at risk of extinction and 17.300 threatened. By considering the extinct species of birds, reptiles, amphibians and mammals in the last 500 year period, it was possible to determinate the actual extinction rate and to extrapolate it to match the past mass extinctions. According to the calculation the extinction rate today is already significantly higher then the background rate and depending on the scenario (assuming that the today threatened species will be extinct in the next 100 years) an extinction rate comparable to the past mass extinction can be reached in the next centuries to millennia. Despite these gloomy predictions there is still a glimpse of hope, in historic times we have actually lost only a few per cent of described species, still from a paleontological view the modern extinction rate is lower than the past big five, but there remains little time and much to do to avoid the human induced sixth mass extinction.